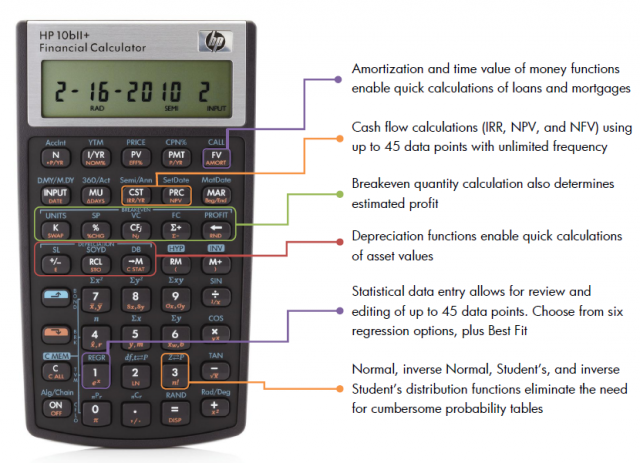 The HP 10bII+ Plus is Hewlett Packard’s revised entry-level financial calculator. It updates the functionality of the earlier HP 10bII since the introduction of the original HP 10B back in January of 1989. These changes really increase the functionality provided on this entry-level financial calculator. The HP 10bII+ Plus now has the HP’s rotate-and-click keys provide confidence with each keystroke. The HP 10bII+ Plus sport dedicated keys that can provide fast access to common financial and statistical functions while giving answers with up to 12 digits of accuracy on its clear and crisp display. HP 10bII+ Plus feature at a glance: Over 170 built-in functions that are easy to access without the use of menus, and are well marked making functions intuitive. These includes common statistical functions like statistical analysis; Standard deviation; Mean; Prediction; Correlation; Probability. Mathematical functions like Trigonometric/inverses, Hyperbolics/inverses, Square root. Financial functions like TVM; loans, savings; leasing; amortization; cash flow analysis: IRR, NPV, NFV; depreciation: SL, SOYD, DB; bonds; interest conversion; margin/cost of sales; and even break-even analysis. The HP 10bII+ Plus can be configured into either Algebraic Mode (default) or Chain Mode by the mode toggle ALG/CHAIN key. When pressed, the display flashes a message to indicate which mode is active. In algebraic mode (with hierarchy), 1+2x3 returns a result to 7. In chain mode (literal left to right), 1+2x3 returns a result of 9. Best used for Accounting, Banking, Business Studies, Finance, General Math, Real Estate, Science and Statistics Applications. Permitted use on AP, PSAT/NMSQT and SA Examinations. HP10bII+ only has Natural Log Key - how to common Log? How to find the total tax liability for $155,000 of taxable income in 20XX, schedule X? Please show work (formula&apos;s) using HP 10bll+ Financial Calculator. Hi. To best use of any financial calculators, is to have a mathematical equation in mind and then use it to crunch the numbers for you. Here is what I am inputting..should the interest be put in differently I am wondering? ex 2)Same ques. as above...Ans: 1,008.33 ?? the 2nd answer represents only 1 month of yield vs 1 year. ex2 has P/YR set to 12 and ex1 has P/YR set to 1. Hit 1, red shift, PMT. Where is the CPT button or how to get CPT? - I am dealing with simple discount rate, number of periods problems and need this button for calculations. Why are my answers for future value, present value or cash flow questions on the hp-10bII always different from the answers from the hp-12C (which are the correct answers)? Please tell me how to line it up so that I can have the correct answers. What is the HP 10bii+ equivalent of the %i function? Help?